(Spanish for 'Cottonwoods') offers some of the most awe-inspiring vistas anywhere. provides stunning natural beauty and a relaxed atmosphere." 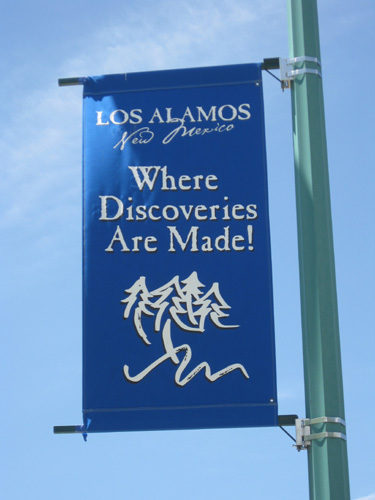 Etched in stone at the entrance to the city, and displayed on bright blue banners all over town, is the motto, "Los Alamos: Where Discoveries Are Made." 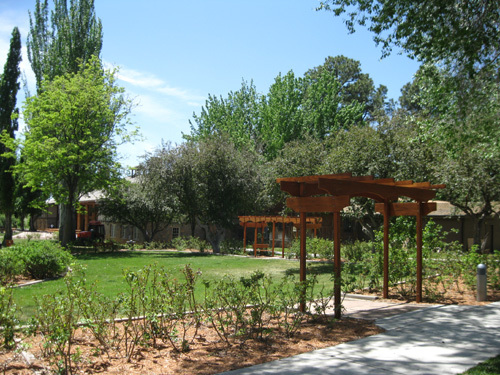 Los Alamos is not only famous for its role as a leader in scientific discoveries, there is also a lot for visitors to discover in the area. Jim and I like learning about its history, from cataclysmic geological forces that formed the mountains a million years ago to ancestral Native Americans who lived here 900 years ago to the scientists at the National Laboratory who have been pioneers in technological innovation since the early 1940s. We're having fun exploring the city, the mountains, and the surrounding area via foot and truck. 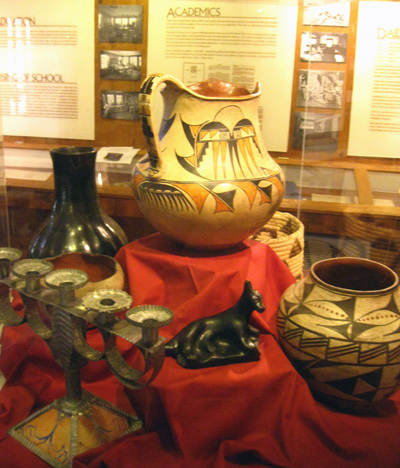 I'll have several entries that showcase some of the cultural, historical, and recreational activities that visitors and residents can enjoy such as Bandelier National Monument and other ancestral Pueblo sites, the Jemez Mountain National Scenic Byway, the Valles Caldera National Preserve, the Rio Grande overlook at White Rock, and various parts of the extensive trail system through town and the surrounding mountains. from the N. Bayo Bench Trail in Los Alamos. We also enjoy browsing in bookstores, museums, and art galleries. 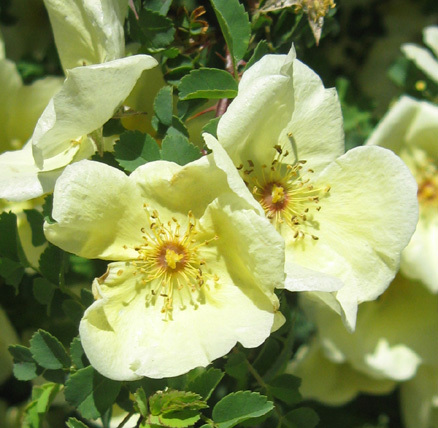 There are plenty of those to keep you busy in the Los Alamos area, too. For other types of shopping opportunities you'll have to do your own research. We aren't big on shopping as a way to kill time, especially on a vacation. Los Alamos has had other monikers. 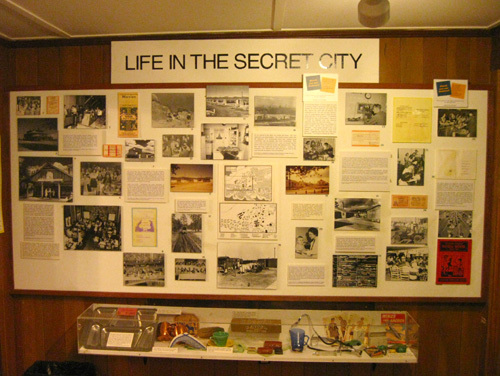 Because of its history as the site of the development of the first nuclear bombs during World War II, it is also called the Atomic City and the Secret City. Although we couldn't take a tour through the technical areas of the huge (38 square miles!) Los Alamos National Laboratory adjacent to town, I'll mention some of its history and show photos from the Bradbury Science Museum, the public arm of LANL. 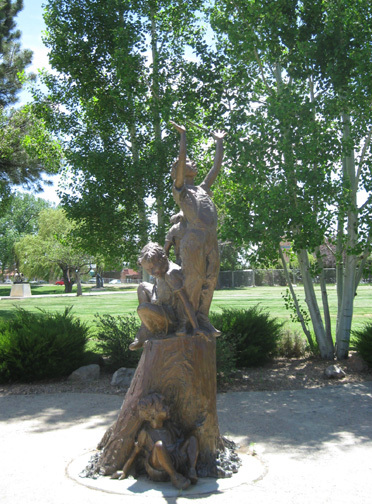 One of the best ways to discover Los Alamos is to start with the official walking tour, which covers local history "from the stone age to the atomic age in 12 blocks," then explore some more on your own. I'll just hit some of the high points on the walking tour here. You can get lots of street and trail maps and other brochures from the very helpful folks at the visitors' center. A little fast-forward through history is in order before we start our walking tour. 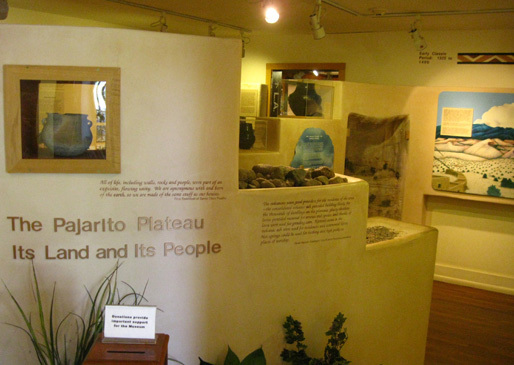 Ancestral Pueblo peoples first inhabited the Pajarito Plateau around Los Alamos in approximately 1100 CE (Common Era, formerly known as AD). After they left the area for more fertile ground along the Rio Grande River in the 1500s, it was subsequently settled by Spaniards, then other Hispanic and Anglo homesteaders, merchants, loggers, miners, farmers, and ranchers. There! Nine hundred years of history in two sentences: that's gotta be the most succinct I've ever been in my life! In 1917, one of the most successful ranches was purchased by an entrepreneur named Ashley Pond and turned into an exclusive school for "privileged eastern boys." The curriculum was rigorous both academically and physically. 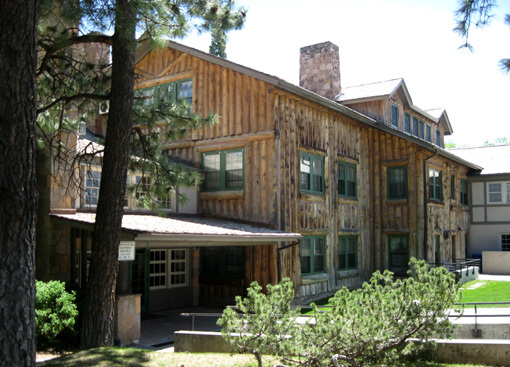 The Los Alamos Ranch School buildings and property were operated for 26 years until the federal government decided it was the perfect place for its top-secret Manhattan Project in 1943-1947. During World War II the Army Corps of Engineers took over the entire mesa and sealed it for their maximum security project to end the war: the development of the atomic bomb. "Some recent work by E. Fermi and L. Szilard leads me to expect that the element uranium may be turned into a new and important source of energy in the immediate future." That was the end of the Ranch School and all privately-owned property on the Pajarito Plateau until the buildings were removed and the post-war laboratory was moved to the mesas south of town. 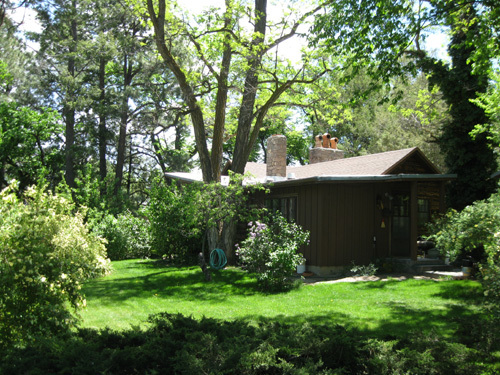 The Los Alamos Historical Museum and Book Shop now occupies the cottage that was originally built for guests at the Ranch School in 1918, then used as auxiliary guest quarters during the Manhattan Project. It is the oldest continually-inhabited building in town. Considering the modest log-and-stone exterior, I was pleasantly surprised at how much information is beautifully presented inside. It literally covers millions of years of geologic, cultural, and political history. This little museum is free and it's a real gem, not to be missed. After the Manhattan Project, wings were added to the building so it could become a hotel. Now it is a community building used for social gatherings, meetings, an arts center for local and regional artists, an archive and research library for the historical museum, and offices for the local arts council. 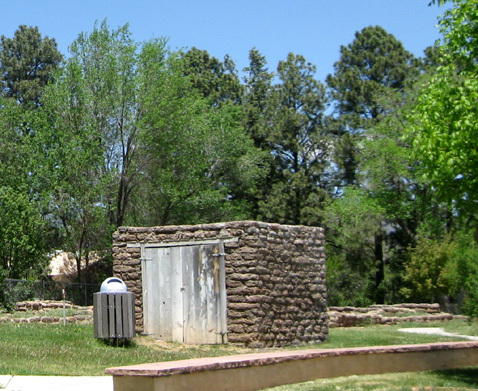 Several city parks surround Fuller Lodge, the historical museum, an ancient pueblo site, an old homesteading cabin, and historic Bathtub Row. All are busy around lunchtime on warm spring weekdays. This reminds me of the foot bridge on the AT across the James River in Virginia, named after a fella named Foot. I mused that it was the Foot Foot Bridge. Ashley Pond (guess who that's named after??) is right across Central Avenue from Fuller Lodge. 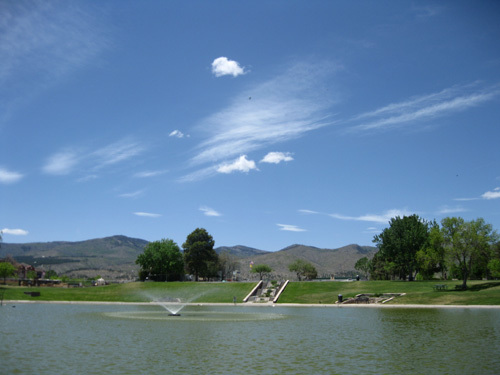 Now a popular park for residents and visitors, the pond was used for recreation by the boys at the Ranch School in the '20s and '30s. Students got a kick out of naming the pond "Ashley Pond" after their founder. Blocks of ice were cut from the pond in the winter and stored in the Ice House, which no longer stands. Now there is a monument to the Manhattan Project on the Ice House site. During WWII the Project's laboratories surrounded the pond; nuclear components of the Trinity device were assembled there. Those buildings are gone now and have been replaced by public offices and private businesses. You'd never guess the history of the place just by looking at this serene setting now. 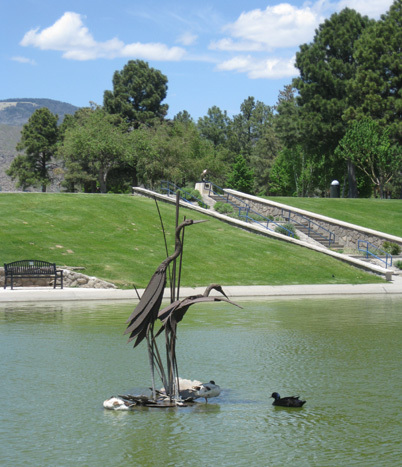 The pond is surrounded by inviting walkways, grassy hills, and varied sculptures that belong to the county's art collection. It appears to be a popular gathering place for people of all ages. 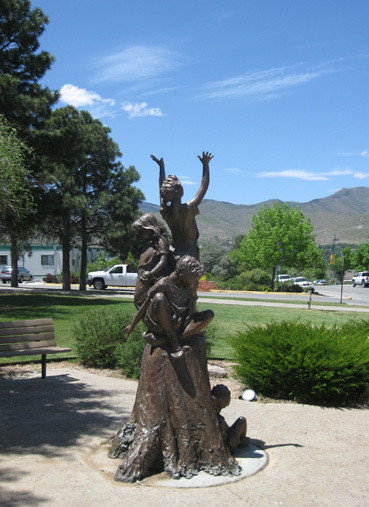 One of the nearby sculptures, "Touch the Sky" by Jane DeDecker, commemorates the devastating Cerro Grande wildfire that destroyed about 400 Los Alamos homes and 48,000 acres of trees in the mountains west of town in 2000. 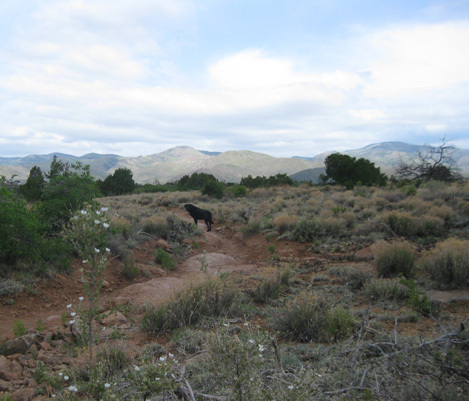 The Jemez Mountain Trail Runs pass through part of the burn area, which is gradually recovering. I was a bit surprised to find an old Native American dwelling site (below) in the middle of town. It was built about 1225 CE by ancestors of modern-day Pueblo groups that later moved to the Rio Grande Valley. The rooms were built with blocks of "tuff," the volcanic material common in this area. You'll see lots more "tuff" dwellings in the entries on Bandelier NM and the Tsankawi site. The Ranch School appropriated some of the stones from the ancient dwellings for their fire house, below, which would be seriously frowned upon today! 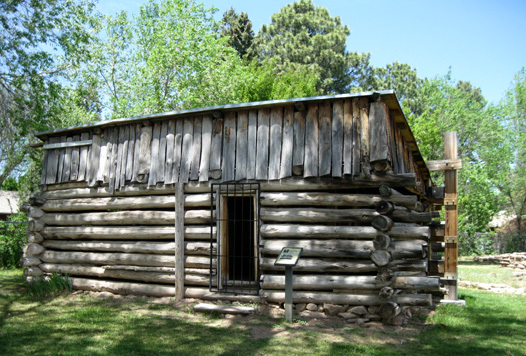 Next to the firehouse is the Romero Cabin (below), an old house built in 1913 on a a nearby mesa. It was one of many homesteads acquired by the government in 1942. The building was moved to this in-town location next to the historical museum in 1984. The original owner, Bences Gonzales, worked for the Ranch School, then the Army, and then the National Laboratory. "Bathtub Row" is the name of a street and several houses along its one-block length. 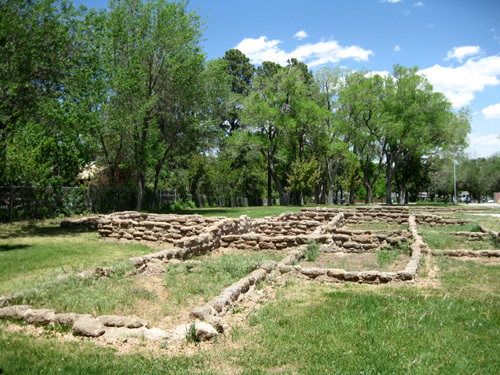 It is on the west side of the pueblo site. Originally faculty housing for the Ranch School, the houses became home to J. Robert Oppenheimer, Director of the Manhattan Project, and other top project leaders during WWII. Since the homes were more plush than other military houses -- and had the only bathtubs in town at the time -- the street was dubbed "Bathtub Row." Although the houses are fairly small they are nicely landscaped and historically significant. All are in private hands now and not open to the public. 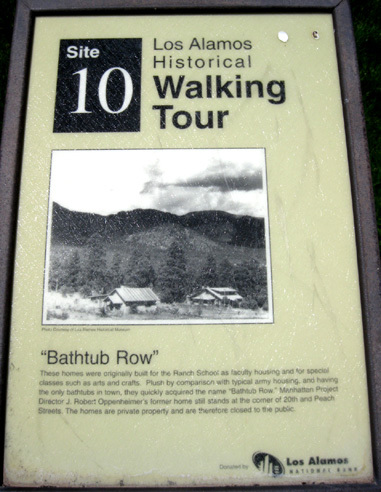 The walking tour includes other buildings and former sites with historical significance. I'll let you discover those! 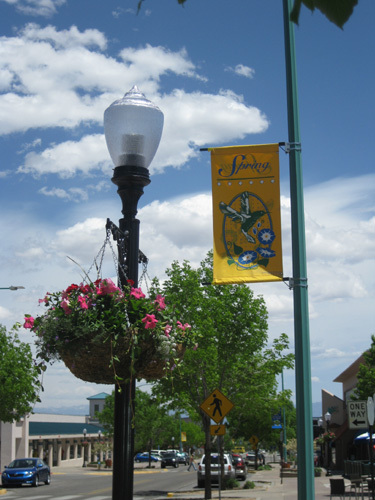 The city of Los Alamos pretty much exists because of the National Laboratory, which covers a lot more ground than the city itself. Almost twelve thousand people work in the Lab's 2,100 + individual facilities. Employees and contractors drive to work not only from nearby Los Alamos and White Rock, but also from as far away as Santa Fe (35 miles) and Albuquerque (90 miles!!). We know several ultra runners who either currently work at LANL or who have retired from there. They cover a wide range of professions that mirror the multiple branches of scientific and technological work at the facility. The Lab began with a wartime mission to protect the free world. That is still its primary mission: national security. As such, most of it is off-limits to visitors. In addition to defense, a wide range of programs are designed to solve problems in the fields of energy, environment, health, space exploration, and infrastructure. The Lab prides itself on being one of the premier scientific institutions in the world, playing a role in many discoveries and advancements in the fields of material science, biotechnology, physics, chemistry, super computing, modeling of complex systems, and others. 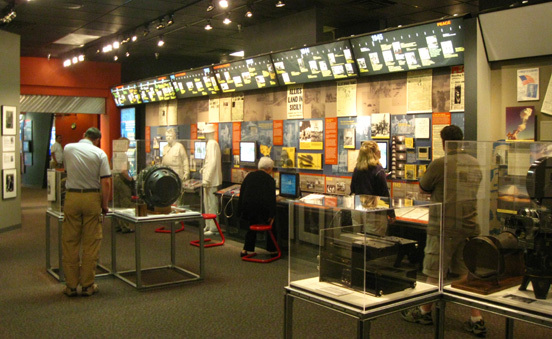 Because the technical areas of the Lab are not open for public visits, the Bradbury Science Museum was built to showcase the institution's history, national security mission, and numerous scientific and technological research projects. Even though Jim and I both visited the museum several years ago, I didn't remember much of it and wanted to go back this week for a refresher course. The museum has dozens of high-tech interactive exhibits and stationary displays to educate and entertain folks of all ages. 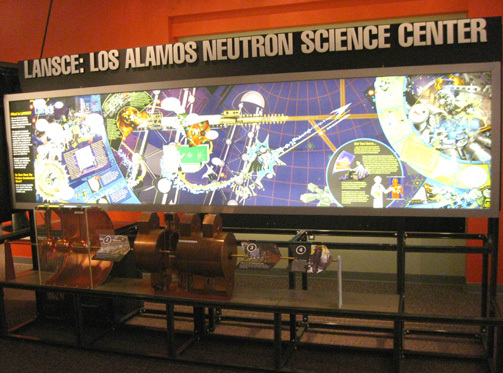 There are three main galleries focusing on defense, research, and the history of the atomic age, a stage for live demonstrations by the science education staff, an auditorium that shows a film about the Manhattan Project and Los Alamos during WWII, and a theatre that shows a film about the Lab's current mission to maintain our country's aging weapons without nuclear testing. An interesting public forum space is reserved for the display of "alternative perspectives" by groups who don't agree with the role the Laboratory has played since 1943. I didn't take any photos of that area but did take a picture of some anti-nuke bumper stickers in a similar area at the historical museum. One I've never seen before struck my sense of "gallows humor" and I had to laugh: "One nuclear bomb can ruin your whole day." 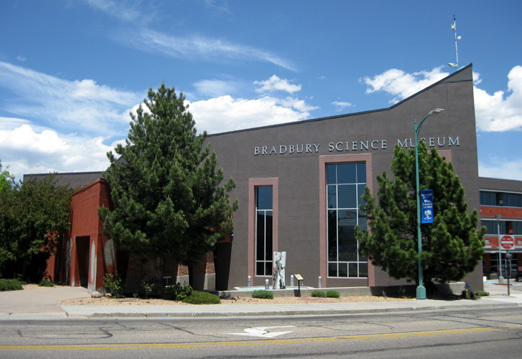 The Bradbury Museum, named for Norris Bradbury, the Lab's director from 1945 to 1970, has its own interesting history. It was first housed in the Ice House near Ashley Pond, opening to visitors in 1954. It was later moved to another building with additional space. When that also became too small to handle the number of visitors it drew, the current building was opened in 1993. Over 100,000 people now visit the museum each year. It is free and open every day except Thanksgiving, Christmas, and New Year's. We've really enjoyed our visit to Los Alamos, a small, high-altitude (7,500 feet) mountain town with about 18,000 residents. Another 6,000 people live in nearby White Rock. Los Alamos has the feel of both an artists' colony and a college town. It has one of the highest levels of educational attainment of any community in this country because of its proximity to the Lab. There are a lot of bright people employed there, and some make their home in Los Alamos. It's not a cheap place to live, however, so many of the employees choose to live in more affordable communities farther away and commute. Pretty spring-flowering shrub along Bathtub Row; many lilacs were also in bloom. With the detailed maps we got at the visitors' center it was easy to find our way around the three mesas on which the town is built. Although we visited briefly in 2003 on a daytrip from Santa Fe, we didn't remember much about the town so we had to learn our way around. We drove on quite a few of the downtown and neighborhood streets during the ten days we visited. 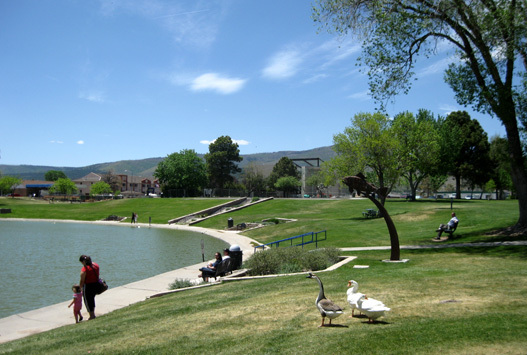 We enjoyed the visual treat of the many attractive homes and yards, spring flowers and trees, public works of art, historic buildings, interesting shops, neighborhood parks, golf courses, and scenic views of mountains and canyons. Recreational opportunities abound here in every season. Since we're basically snow-phobes, however, a late spring visit suited us just fine for our trail running and walking adventures. So far the weather has been just gorgeous -- pleasantly warm, sunny, dry. We've discovered it can get quite windy and chilly on the mesas, especially at night, while down in a protected canyon only 200 feet lower it can feel ten or fifteen degrees hotter where the air is still. I've done one weight workout at the local YMCA, which welcomes visitors in the "Away Program." I'm still doing lots of physical therapy in the camper for my injured rotator cuffs. Jim's tapering for his race and I haven't had time to get out on our mountain bike yet but all of the paved trails and some of the dirt ones are easy enough for us to ride if we ever come back and have more time for cycling. Skilled cyclists would love the more gnarly options around here. Jim and I don't eat out much, either at home or when we're traveling. It's always fun to try some local fare, however. We were a bit disappointed in a lunch at DeColores Restaurant, adjacent to our campsite, but we really enjoyed the fruit smoothies and fruit bagels at Ruby K's Cafe and wish we'd had lunch there instead. Their selection of sandwiches and soups looks delicious; too bad we didn't discover it until too late. Ruby K's is a sponsor of the Jemez race, providing lots of bagels. Our only other dining experience in Los Alamos held a nice surprise: live belly dancing by two accomplished young ladies! We chose the Pyramid Cafe on Saturday night, the day of our arrival. We just saw it in passing; it is located in the same block as the visitors' center. The restaurant features delicious Greek and Mediterranean cuisine. After some tough decision-making, we both chose Greek dishes that were large enough that we took home leftovers. I enjoyed my Souvlaki, marinated and grilled kebobs with chicken breast meat and chunks of vegetables served over basmati rice. Jim also liked his Moussaka, a baked, layered dish with saut�ed eggplant, beef, cheese, tomato sauce, and herbs. Our dinners both came with pita bread wedges and a large Greek salad with feta cheese -- and lots of entertainment! The women are part of a group of three called Saltanah Dancers. They also perform at the Pyramid Restaurant in Santa Fe, weddings, parties, festivals, and other events. They were good and we tipped them well. After seeing/hearing how much loud traffic passes our camper each morning and afternoon on weekdays, we checked out the only other approved camping areas near Los Alamos at Bandelier National Monument and above the Pajarito Ski Area. Despite the racket, we decided we were already in the best place for us: the county-run RV parking area where we landed on Saturday. TV and cell reception (think internet) are great up high on the mesa, the price is right, and the location is convenient. We can deal with all the traffic noise (think earplugs) until we are able to move to the race finish area on Friday. Besides, we aren't in the camper much anyway -- there's too much to do here! 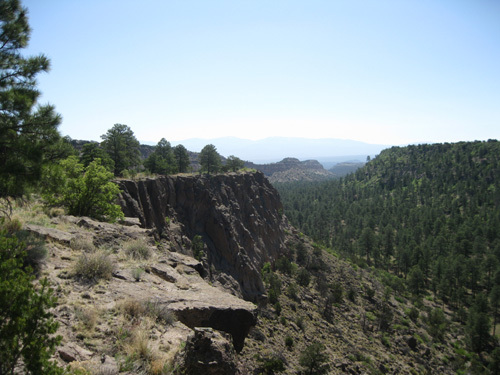 As much as we enjoy driving and walking around town, we are even more interested in exploring the extensive network of trails in and around Los Alamos (especially some of the Jemez Mountain Trail Run course) and visiting several historical and scenic sites in surrounding counties. I'll talk about those forays in the next entries.